Maribeth originally graduated from the University of South Carolina with a Bachelor of Arts (Music-Business Minor). A few years after graduating, she decided to return to receive her Bachelor of Music (Music Education). While at Carolina, Maribeth performed with the USC Steel Band (Palmetto Pans), USC Marching Band (Mighty Sound of the Southeast), USC Symphony Orchestra, USC Wind Ensemble, USC Symphonic Winds, USC Percussion Ensemble, SC Philharmonic (substitute), and Alliance Drum and Bugle Corps. While completing her degrees, Maribeth studied with Jim Hall and Scott Herring. Maribeth was able to start teaching percussion lessons while in high school to middle school/beginner band students. While at Carolina, she taught percussion lessons to high school students. Also during her time at Carolina, Maribeth worked as a percussion tech and instructor (battery and front ensemble) for local marching bands. 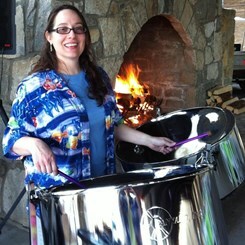 Maribeth is currently going into her seventh year performing with the fun and festive Pantasia Steel Band (Percussion, double seconds, drum set, and lead pan). In addition to performing with Pantasia, Maribeth plays percussion for local church services and theatre productions. She has also just started her second term as Member at Large for the Lexington Community Band. Request Lessons with Maribeth today!